Addictive copy of a famous board Game!Are you clever enough to guess the colour-code? In Mastermind, its the codemaker against the codebreaker! To play, the codemaker sets up a code of color pegs under the shield. Then the codebreaker takes a guess by lining up rows of pegs at the other end of the board. With every guess the codebreaker gets clues from the codemaker while working towards cracking the code. After both players have taken turns being the codebreaker, the one who broke their code in the fewest moves is the winner! Test your code-cracking prowess with Mastermind, "the challenging game of logic and deduction." The codemaker sets a code of four colored pegs — choosing from yellow, red, orange, blue, green, or white — and conceals it behind a flip-up shield. Your mission: replicate the code in 10 moves or fewer. With each of the codebreakers attempts, the codemaker uses red and white key pegs to offer cryptic clues about color and position. 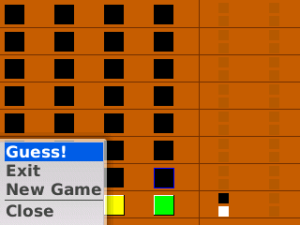 Make the game even more difficult by using multiple pegs of the same color or by leaving one or more peg holes empty. With more than 2,000 possible code combinations, every game is guaranteed to be a brain-bender.